Set in a very tranquil location, with ample gardens and beautiful lawned pool area overlooking Porto Mos beach, Lagos, the setting of Vivenda Miranda is unbeatable. Ocean views are yours to enjoy from breakfast on the terrace, relaxing by the pool during the day or enjoying some delicious and healthy al-fresco dining. Former private home of a 17th century noble family, Vivenda Miranda breathes truly individual design. 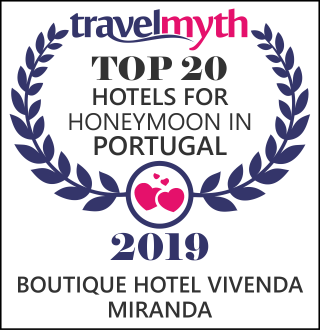 Just 24 rooms and suites are styled in either traditional Portuguese or contemporary bohemian chic design and offer beautiful views amongst lush gardens and the ocean. In line with our ethical, environmental and wellbeing policies we host a series of health, fitness and wellness breaks and courses run by leading coaches in their individual fields. Neal’s Yard Remedies (NYR) is our health and wellness partner with their first overseas beauty Spa. As part of our commitment to healing and wellness, we are offering all guests complimentary Yoga sessions. These will take place, weather permitting, at our outdoor exercise area. It is also possible to book private personal training, couples personal training and group training classes. Your workouts will be under the guidance of RFS FITNESS, within the grounds of our hotel overlooking the sea, in the botanical gardens of our Quinta, at one of our stunning beach locations or at RFS FITNESS studio which is based in Praia Da Luz. With prior notice, we can also arrange Tai Chi and Qigong lessons to be held in our beautiful garden. Never the ecological and economic situation has been so much in the centre of debates. We must change our way of life while respecting the nature, human beings and agriculture. We would like to do better! Never the ecological and economic situation has been so much in the centre of debates. We must change our way of life while respecting the nature, human beings and agriculture. We would like to do better! We continuously strive to improve our environment and that of those around us through introducing a variety of measures that reduces our global ecological footprint and minimises pollutants, water usage and waste whilst supporting and giving back to the local economy.